Mandopop singer Joker Xue (薛之謙) has a successful singing career, but his personal life is filled with scandals. From infidelity to divorce to reconciliation and now being a new dad, Joker has gone through it all. Yesterday, his ex-girlfriend dished out more dirt, accusing him of having an affair with Mainland actress Li Xiaolu (‎李小璐). The news quickly started trending on social media, as Li Xiaolu was involved in an extra-marital affair with another artiste earlier this year. On a recent episode of Mars Intelligence Agency <火星年度總結>, Joker became emotional as he revealed his struggles and on dealing with his career and family. He turned teary-eyed as he listened to the three guests who said they liked him for a long time. He said, “Thank you three guests for coming forward to say you like me. This is very important to me. I believe someday there’ll be someone who will see my story and let everyone know the truth. There is no hurry.” Perhaps seeing this, his ex-girlfriend, Li Yutong (李雨桐), with whom he had cheated on his wife, and accused Joker of forcing her to abort their baby. Calling him out on Sina Weibo, Li Yutong, “I saw something that made me want to disclose some news, but I can’t. This is the cost of maturity.” She then added, “Hypocrite! Who are you to cry! 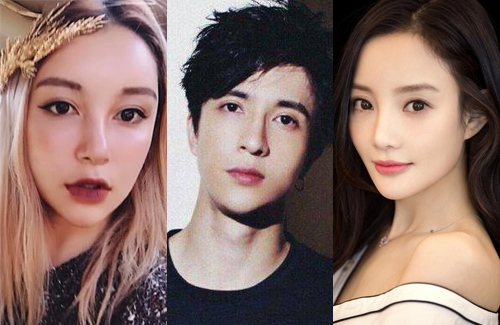 Will you be content after your relationship with Li Xiaolu is exposed?” Li Yutong hinted that she had a list of women who were involved with Joker. This caused some heated conversations online, as netizens analyzed the post and some remembered that this news was mentioned two years ago, and it had said Li Xiaolu was cheated money and love by Joker. Others commented that they were together before his reconciliation with his wife, and further fueled the situation by calling him a player. However, since there is no evidence, it’s unknown as to whether these rumors are legitimate. Some netizens said they’re just groundless rumors and even if he’s a celebrity, it isn’t necessary to dig up his personal life and condemn him. Li Xiaolu Split from Jia Nailiang? Nailiang’s reply made many curious whether he and Xiaolu had gotten a divorce, as opposed to earlier rumors that the pair had reconciled.